Sakana no nitsuke, is a Japanese term that refers to simmered (nitsuke) fish (sakana). Some of the more common types of fish that are used in this very traditional and rustic dish include rockfish (mebaru), flounder (karei), mackerel (saba), and black cod (gindara). 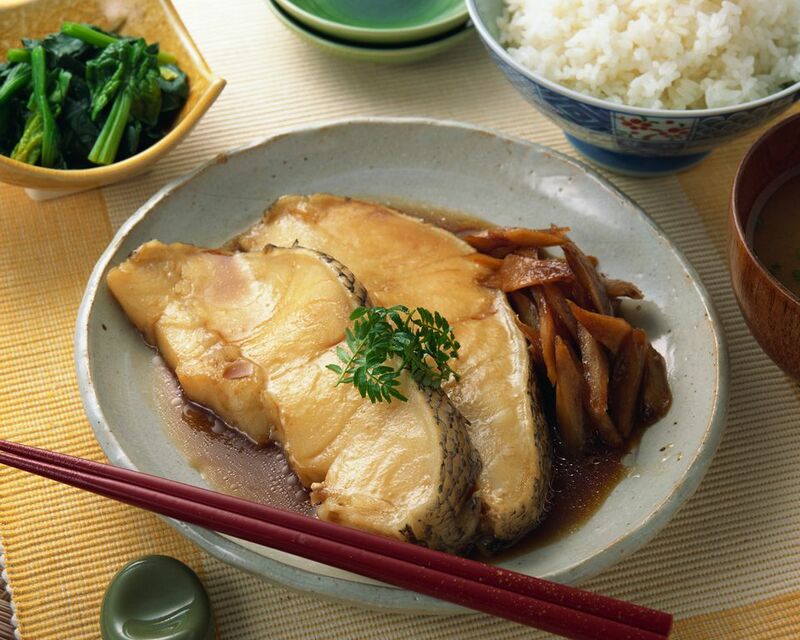 For the purpose of nitsuke, however, almost any type of fish with white flesh may be used in this recipe. The simmering sauce for Japanese braised fish is often a combination of staple ingredients in Japanese cooking which includes soy sauce, sake, mirin, and sugar. The flavor profile of the sauce is primarily soy, but depending on the chef, the sweetness of the nitsuke varies. Aromatics such as ginger are more common than garlic, which is historically less common in traditional Japanese cooking. A special piece of cooking equipment used for Japanese cuisine is a Japanese drop lid. A drop lid is commonly used when braising foods in Japanese cooking. It helps to cook braised foods evenly and minimize burning. Remove any extraneous fish debris and minimize any “fishiness” flavor and aroma by first cleansing the fish with hot water. Note, if the fish fillet is cooked with the skin intact, first score the skin prior to this step. Boil water. Place fish in an empty pot and slowly pour hot water over it until it's covered. The fish will cook slightly, releasing small debris and aroma. Drain the hot water. Then immerse the filets in cold water and drain again. Next, combine sake, mirin, soy sauce and sugar in a saucepan and bring to a boil over high heat. Add the fish fillets to the saucepan and cover them with a Japanese drop lid. Cook the fish for 10 minutes over medium-high heat. Continue to cook the fish until the simmering sauce is reduced to half. Next, add tamari soy sauce and ginger. Simmer for an additional 5 minutes, or until the simmering sauce has thickened. Remove the pan from the heat. Serve filets in shallow individual dishes. Pour some of the simmering sauce over the fish. Garnish with optional sliced green onions or fresh ginger.